Our farm tours are hands-on interactive, informative events that offer people of all ages a great way to experience life on our family goat farm. We offer several different pricing and activity options. The Basic Tour is $60. You can bring up to 10 people for this price. If you have more than 10 people the cost is $6 per additional person. The Basic Tour includes a guided tour of all our barns where you will learn about how we care for our animals, hear about the history of the farm, have an opportunity to milk a goat by hand, and bottle feed and hold babies (the baby goat activities are seasonal so make sure you check on dates for this). This tour takes about an hour. Times vary depending on weather, time of year and size of group. The Sampling Tour is $80. You can bring up to 10 people for this price. If you have more than 10 people, the cost is $8 per additional person. The Sampling Tour contains all the activities included in The Basic Tour plus sampling of our fresh pasteurized milk and cheese. This tour takes about 1 ½. hours. Times vary depending on weather, time of year and size of group. The Hayride Tour is $100. You can bring up to 10 people for this price. If you have more than 10 people, contact us for prices. 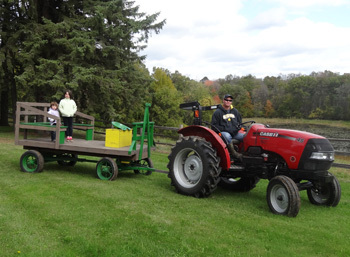 The Hayride Tour contains all the activities included in The Basic and Sampling Tours plus the group will be given a hayride through our fields on our restored hay wagon and a walk through the trail in our woods to a small peninsula on Fish Lake. This tour takes about 2 - 2½ hours. Times vary depending on weather, time of year and size of group. We charge for ages 3+. We do not combine groups so only members of your group will be part of the tour. We have chairs and tables that you can use to picnic at the farm. If you want to use them, please let us know ahead of time. We conduct tours rain or shine, however if the weather is bad, we are fine with last minute cancellations. Tours in nice weather are much more enjoyable for everyone. 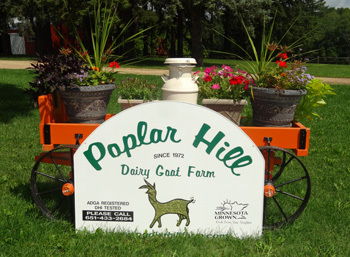 We sell milk, cheese and soap on the farm. If you think you may want to purchase milk and or cheese products, we suggest you bring a cooler with ice. We accept only cash and checks only for payment. Please email or call us at 651-442-2506 if you have questions or want to set up a tour date.